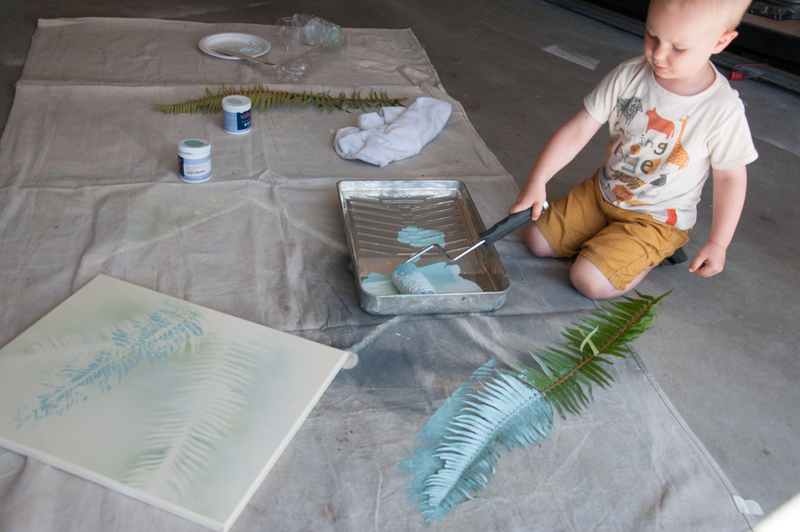 If I instill anything besides a heart for Jesus in my children, I hope it to be creativity. Sadly I believe there is a frighteningly low focus on being imaginative and inventive when it comes to school education. I don’t think anyone can get by without math, reading, and writing skills but life just isn’t as colorful or inspiring without creativity. However, though I love arts and crafts, facilitating and managing art projects for littles is not my strong suit, which I discovered last summer. Now a new summer and my son being another year older I thought we’d give it a go again, once more utilizing both nature and what supplies we had lying around the house and garage. 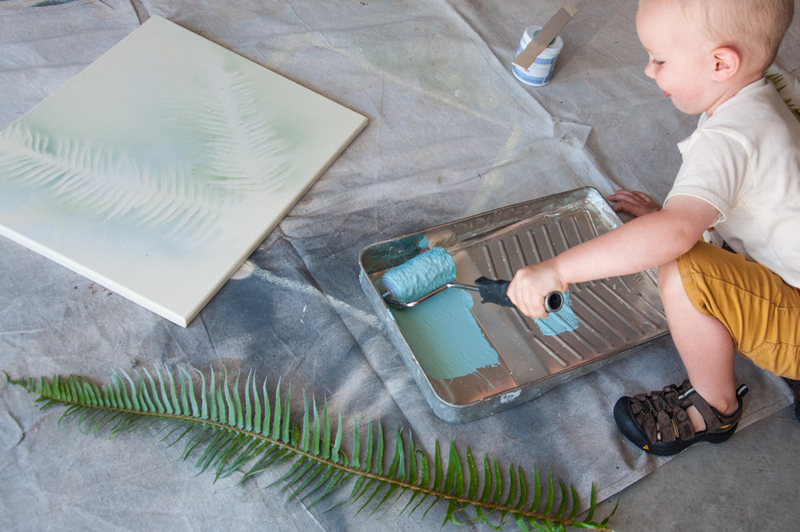 What You’ll Need (and/or suggested) for this Project: canvas, paint, paintbrushes, mini paint roller, paint tray, drop cloth, plastic bag or glove, toothbrush, ferns, patience, and grace. 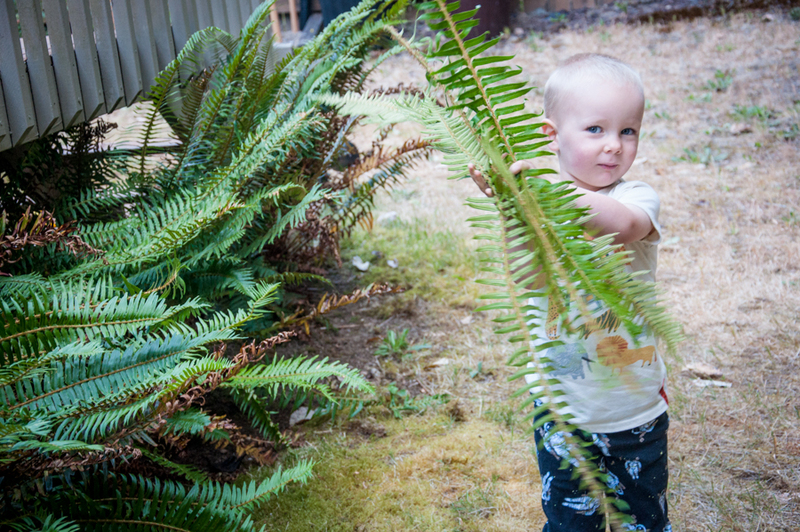 Picking ferns was by far the easiest step of this entire project. 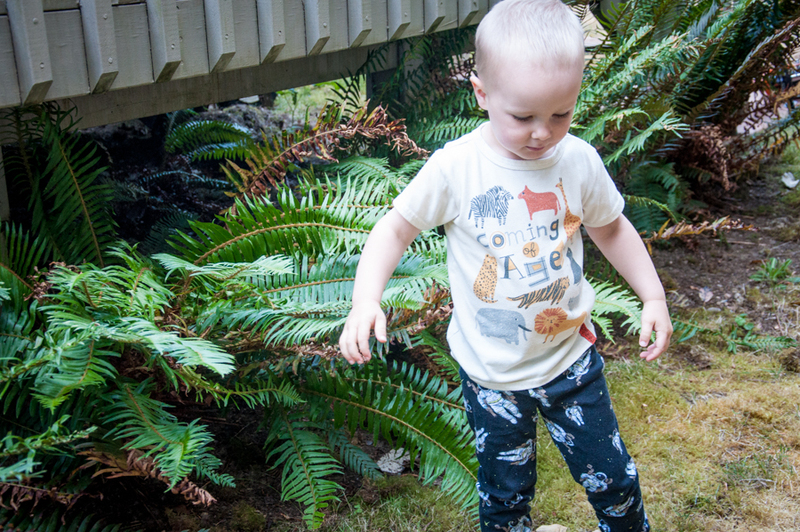 We have quite a few at the base of our deck that I’m actually not too particularly fond of (am I the only northwesterner who doesn’t care for ferns?). Maybe if we had decent soil in the backyard, paired with me watering them, they might look lush and beautiful but as they stand now they’re scraggly and half dead; we’re going for the natural and rustic look I guess. 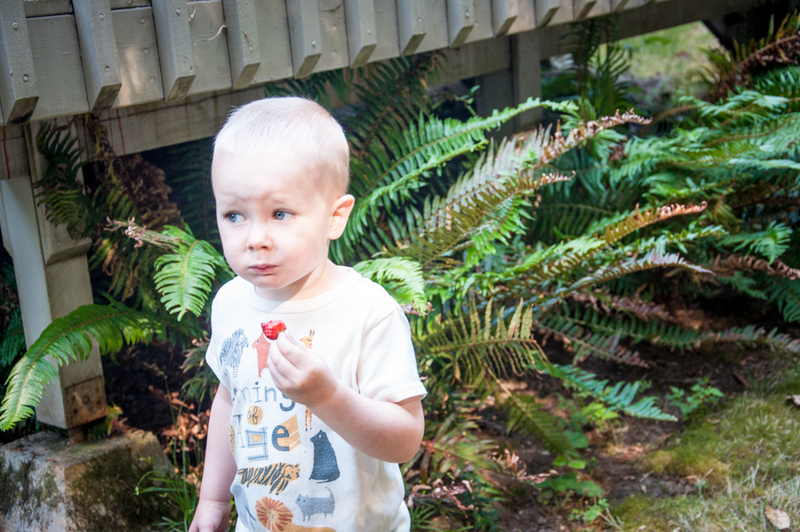 Of course before grabbing a couple ferns we had to pick the ripe strawberries in the garden- priorities. 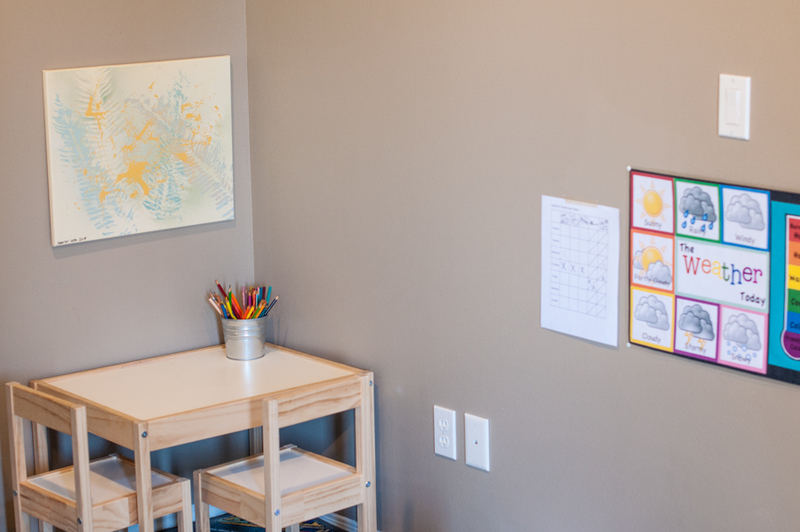 The biggest piece of advice would be to pick a location you don’t mind getting a little painted, we choose the garage. Be warned that as much as you try to keep the space clean, you’re not. I was convinced Gabriel wouldn’t get any paint on his clothes and before I knew it I had a pants-less toddler with paint on the bottom of his Keens tracking it across the garage floor while I ran inside to try and save his shorts from paint stains, may they rest in peace. The baby observed from the Bumbo in the corner giggling all the way. 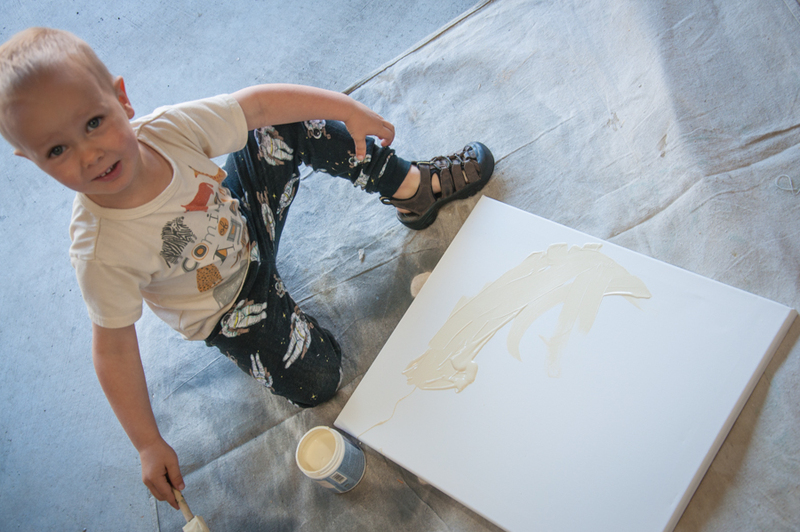 The goal for this project was to have Gabriel create a piece of art that didn’t look like a typical child’s art piece. 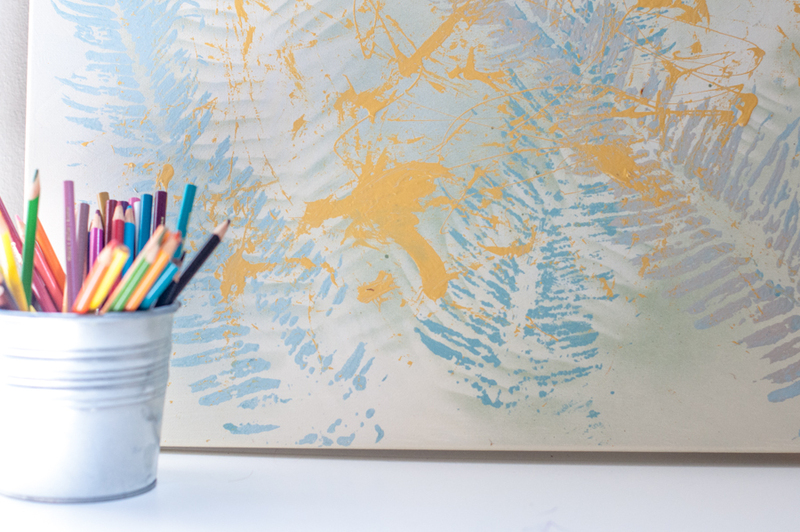 The key to doing this is to have coordinating paints (we utilized all the samples we have store up from trying colors in our house, which also resulted in his piece matching our living room perfectly) and layers of painting techniques. This was the easiest and least parent involved step in creating his masterpiece, if you will. 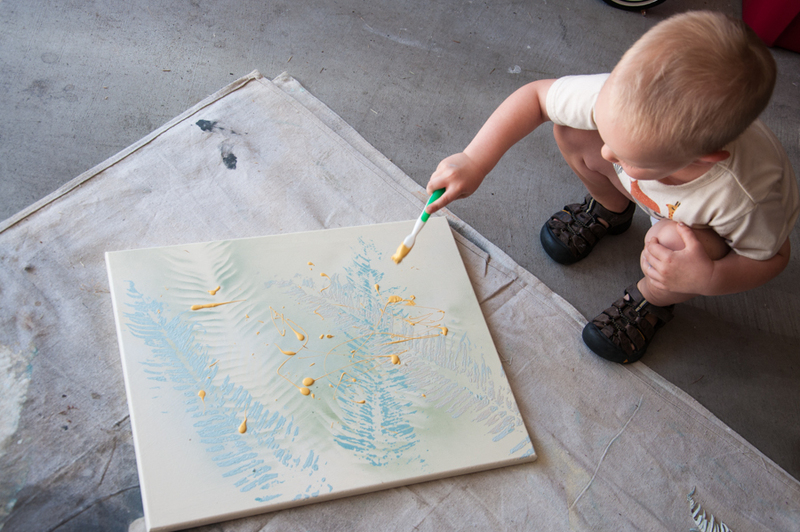 I gave him a paintbrush and the chosen paint color and he spread it across the canvas. I wasn’t worried about it having a perfect even layer since the dried ridges in the paint with uncoordinated thicknesses was going to add to the overall artsy-fartsy of the painting. The one ‘parent only’ step in this project was the spray paint step. The canvas dried during nap time -pause, this is an all day project due to needing layers to dry, end pause- and since I didn’t think Gabriel’s hands were big enough, or finger strong enough, to hold and use a spray can I took it upon myself to do it while he slept. 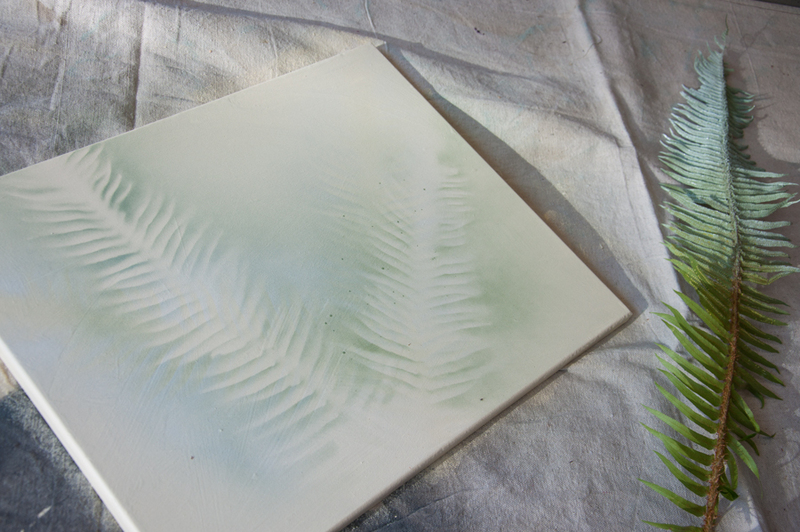 Lay your fern top side down onto the canvas any which way you please then lightly spray over it. 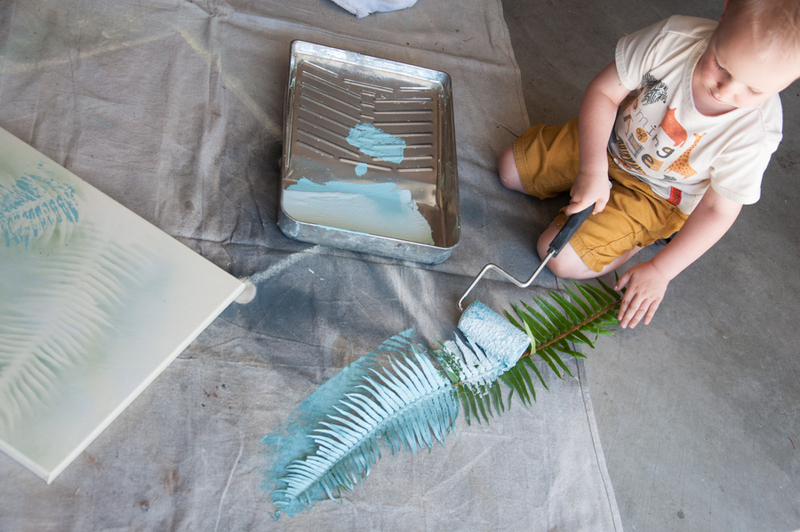 Move the fern, pick a different color paint, and spray again. Feel free to do this as many times as you’d like, there are no rules with art. 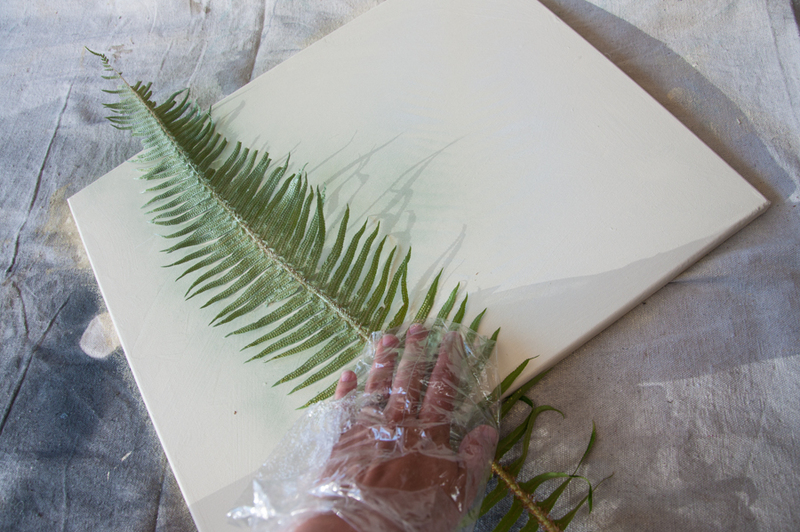 I used a plastic bag over my hand/arm so I could press the fern down without getting paint on myself. By far Gabriel’s favorite step! We took three different colors and using a skinny roller Gabriel was able to roll paint onto the roller and then onto the fern. 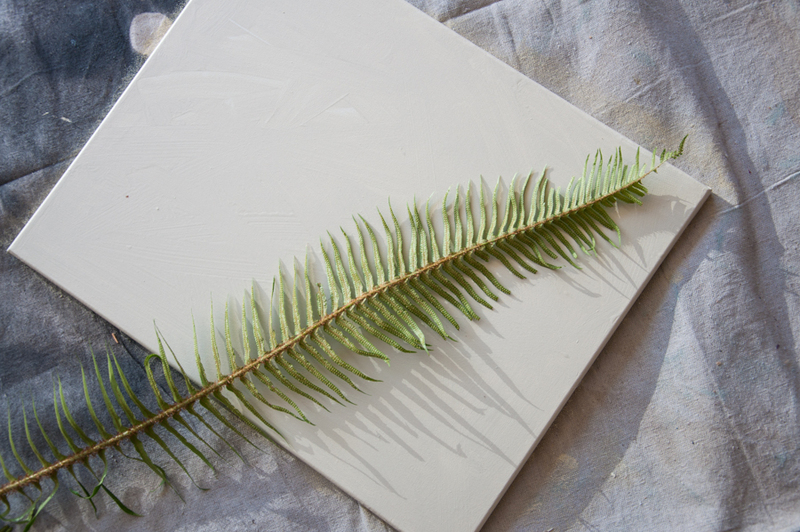 Once the fern was coated I picked it up and together we pressed it onto the canvas. 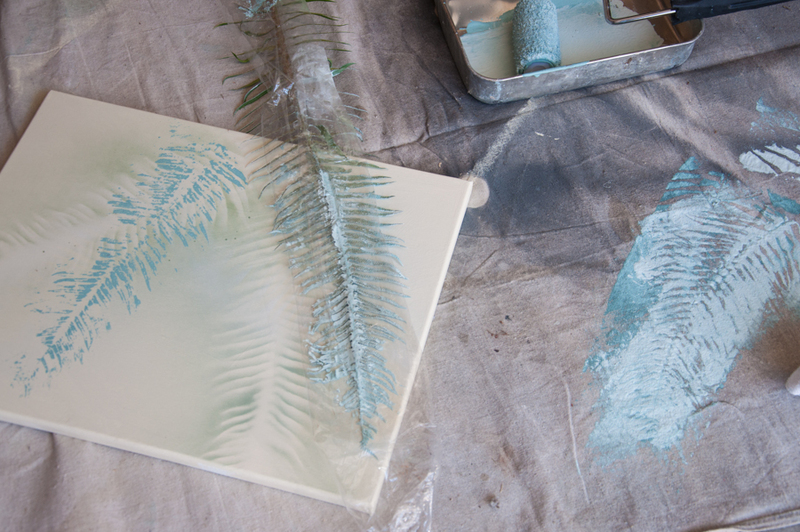 We didn’t switch ferns or even rollers, just poured the next color of paint on top of the last in the paint tray and rolled it on. Notice I put the same bag I used during spray painting as a cover over the fern when pressing. My husband loved it so much! Without prompting he even said, “It looks very northwest!” My mistake was having Gabriel show hubs as soon as he got home and not saving it as a Father’s Day gift from Gabriel; hindsight gets ya every time! Lena, once a Kindergarten teacher, is now a stay at home mama to two handsome little boys. She and her husband have been residents of gorgeous Washington State their entire lives and currently split their time between the PNW and Japan, which surprisingly is very similar to home. When Lena isn't busy being a wife and mama she enjoys working on her small business Root and Blossom. You can keep up with Lena through her Instagram and blog/a>. Lena this is beautiful! You’re right, it’s so hard to let kids have 100% ownership in projects! Thanks, Andrea! I know that this is just the beginning of our canvas art projects which means I’m going to be having to figure out what to do with all of them over the year!